Google Play Family Library introduced, lets you share purchased apps, games, movies, TV shows and books with up to 6 family members. 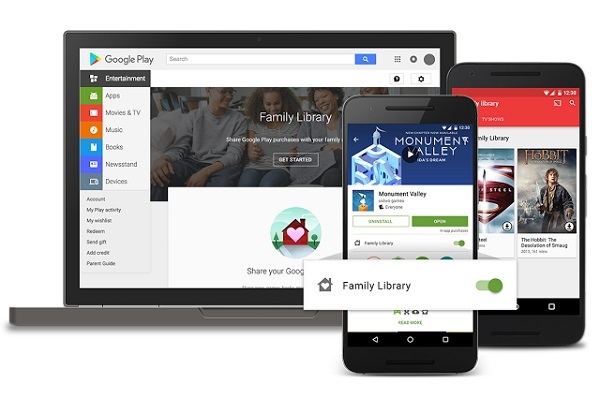 Today Google introduced Family Library, a way for up to six family members to share purchases on Google Play. When you buy an eligible app, game, movie, TV show, or book in the Play Store, you can now share it with your family-across devices-with no additional sign-up fee. All purchases added to Family Library are available across Android devices, and movies, TV shows, and books can be enjoyed on iOS devices and the web. With Family Library, you can choose which items you want to share and which to keep to yourself. Flexibility is also built into your purchasing options. When you sign up, you'll select a credit card to share as your family payment method, but your family members will always have the option of buying stuff with their personal credit cards or gift cards. And for your younger family members, you'll have the option to approve each of their purchases. Finally, if your family loves music, you can also subscribe to the Google Play Music family plan. On this plan, up to six family members can stream millions of songs on demand for $14.99 a month.